Naomi is a valued member of the team that coaches most days of the week. She has a bubbly personality that all members of staff and children warm too. Naomi doesn’t come from a gymnastics background, but once she was shown the ropes she soon picked it up and is now a mentor to the up and coming younger coaches. She is kind, patient and one that all the gymnasts want to work with. Arabian Masters Qualified First aid trained 2017 Coached in Hampshire for many years. Coaches Tuesday evenings and also Saturdays. Emma was a gymnast with Arabian and after spending some time volunteering towards her Duke of Edinburgh award she realised she really liked coaching. Emma helps out one evening in the week and with the boys squad on a Sunday. 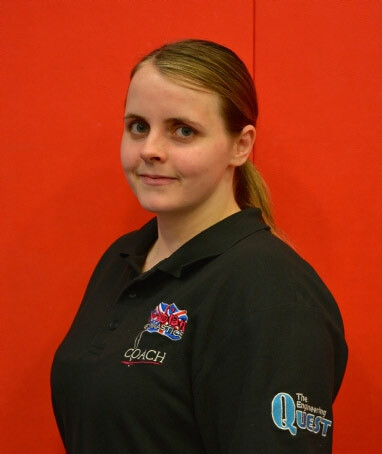 Britsh Gymnastics Level 1 qualified First Aid Qualified 2017 British Gymnastics Judge Qualified Jaye started coaching in 2012 and teaches the youngest of the top squad girls. A wonderful personality that will often give up her free time to help the club out with judging or home competitions. Saturday Receptionist Karen has worked on reception for many years and is the first friendly face you see as soon as you walk through the door. Trainee Coach An experienced dancer Lauren teaches once a week alongside some of Arabian’s senior and most qualified coaches, learning the basics of gymnastics. From someone who dances almost every day, she understands the demand and skill base needed in such a difficult sport. Chairman of Trustees Involved with the club in excess of 10 years Lee has the expertise to deal with any issues due to his management skills where for many years he has operated and run many businesses.